After trailing to Lukas Jutkiewicz's volley, Smith's side turned it round with two goals in two minutes before the break from Jonathan Kodjia and Jack Grealish, followed by a Tammy Abraham penalty just after the restart. Kristian Pedersen jangled the nerves by pulling one back, before Alan Hutton settled the outcome with his stunning late run and neatly placed left-foot finish. "It was a great result but not so good a performance," boyhood Villa fan Smith told BBC Sport as he reflected on a win in his first derby. "It's a game I wasn't enjoying because, for 30 minutes, we didn't play very well. But I got the chance to savour the atmosphere in the end. "It was a fantastic crowd and we got to sent a lot of people home happy. And it'll make a lot of my family and friends happy too." 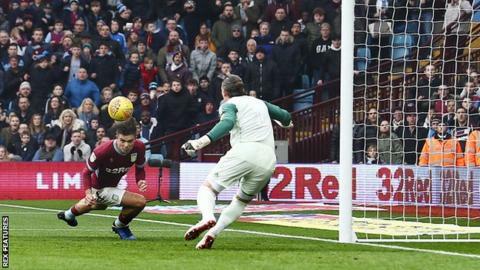 Villa's third straight win - and fourth in six games under their new boss - lifts them to eighth in the Championship, four points off the top six, while extending Birmingham's winless run in this fixture to 13 league derbies. A typically tense derby tussle took almost half an hour to ignite before Blues went ahead on 28 minutes - their first goal at Villa Park since Mikael Forssell scored in the 5-1 defeat here in April 2008. Connor Mahoney's swinging left-footed right-wing corner was allowed to travel all the way through to the far post, where Jutkiewicz timed his run superbly to arrive almost as if choreographed to turn in his 10th goal of the season. It might have been a different story if Che Adams had not wasted a glorious chance of a second when he then hit the post from close range. Instead, by the 39th minute, Villa were ahead - both set up by right-wing crosses from Albert Adomah, and both down to slack defending. Kodjia was allowed too much space to turn and drill home through Maxime Colin's legs from eight yards. Then, from Adomah's wickedly dipping left-foot delivery from the flank just two minutes later, Grealish was left hopelessly unmarked and City keeper Lee Camp stood flat-footed as the Villa favourite stooped to head home his second goal in successive home games. Following that remarkable two-minute turnaround when the Blues defence simply went to sleep, Villa struck again when Abraham fell over Michael Morrison's legs before getting up to turn in the penalty himself. Pedersen gave City hope when he with volleyed home Adams' cross into the bottom corner for his first goal for the club. But Hutton had the final word on 76 minutes with a goal worthy of headlining any football contest - a long run from 10 yards inside his own half on the right, a jink inside into the penalty area and then the coolness to glide the ball inside Camp's right post with his left instep. "You always have a perception about any player when you join a club," added Smith. "But I've only got good things to say about Alan Hutton. And he put his stamp on the game with that. "I always thought we could get in behind them. But to score four, win a derby and not play very well, there's no saying what this group of players can do. And I sense the players can see it too now. Our aim was always the top two and it still is." Birmingham City boss Garry Monk says it was a lack of 'toughness' that proved costly as he suffered defeat as a manager for the first time against Aston Villa. In eight previous meetings with Villa at Swansea, Leeds and Middlesbrough, Monk's teams had won six and drawn two of them. But he admitted that, after it had all gone to plan for the first third of the game, too many things went wrong after that - starting with the Adams shot that hit the post. "For the first 35 minutes, we were excellent," Monk told BBC Sport. "And, but for a lick of paint, we could have had two. "But, from then on, we didn't show that toughness we've been used to." Blues had gone into this game on the back of a defeat at Derby, followed by a 3-3 home draw with Hull City - and Monk is looking to his side to rediscover the resilience that inspired an 11-game run prior to that. "In the last three games, we've come away from that toughness a bit," he added. "We've not been as dogged. And we've got punished for it. We need to get back to that toughness. There are no excuses. We knew what our limitations were in the summer." Match ends, Aston Villa 4, Birmingham City 2. Second Half ends, Aston Villa 4, Birmingham City 2. Attempt missed. Omar Bogle (Birmingham City) header from the centre of the box misses to the right. Assisted by Charlie Lakin with a cross following a corner. Corner, Birmingham City. Conceded by Jack Grealish. Corner, Aston Villa. Conceded by Kristian Pedersen. Corner, Aston Villa. Conceded by Michael Morrison. Attempt blocked. Lukas Jutkiewicz (Birmingham City) left footed shot from the centre of the box is blocked. Assisted by Charlie Lakin. Attempt missed. Tammy Abraham (Aston Villa) header from the centre of the box misses to the left. Assisted by Ahmed El Mohamady with a cross. Substitution, Birmingham City. Charlie Lakin replaces Craig Gardner. Substitution, Aston Villa. Ahmed El Mohamady replaces Henri Lansbury because of an injury. Alan Hutton (Aston Villa) is shown the yellow card for excessive celebration. Goal! Aston Villa 4, Birmingham City 2. Alan Hutton (Aston Villa) left footed shot from the centre of the box to the bottom left corner. Henri Lansbury (Aston Villa) wins a free kick on the right wing. Substitution, Aston Villa. Henri Lansbury replaces Glenn Whelan. Attempt missed. Tammy Abraham (Aston Villa) header from very close range is close, but misses the top left corner following a corner. Substitution, Aston Villa. Yannick Bolasie replaces Albert Adomah because of an injury.